When I went to Bentley Wood a week or so ago now looking for a butterfly I’d never seen before I wasn’t quite sure what to expect or even where I’d find it. 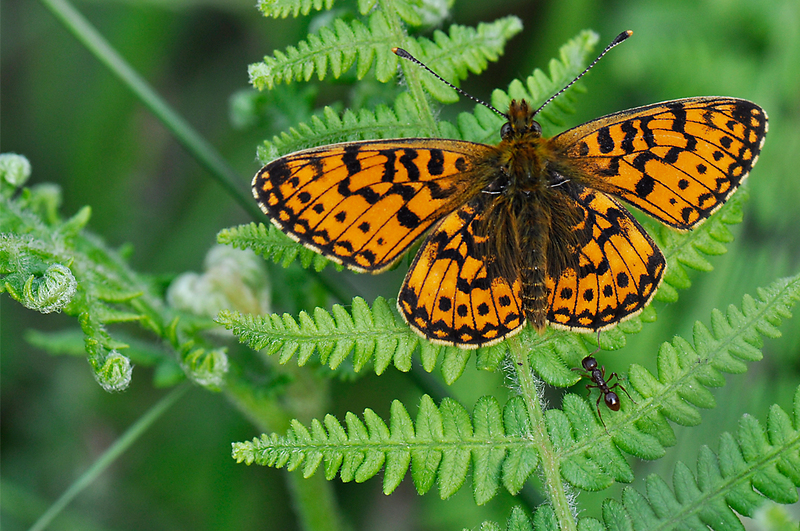 I was looking for the Pearl-bordered Fritillary Boloria euphrosyne but it was further complicated by the fact that the Small Pearl-bordered Fritillary Boloria selente was to be found there too and I’d never seen that before either. As it happened both were flying at the same time and to a novice like me both looked very similar. On my first visit I’d definitely spotted and photographed one of them, but which one? On a second visit a few days later I photographed the one shown above which even I recognised as being subtly different. For a start it was obviously freshly emerged and in comparison with the one seen previously, slightly oranger. I asked a more experienced butterfly photographer, who I’d spotted sporting a pretty damn impressive camera (about 5 grands worth) with a truly whopping macro lens and carrying a huge Manfrotto tripod, if he could offer any advice? Slightly out of breath he said, ‘if you look at the dark brown, inverted ‘v’ marks near the edge of the forewing, if they’re touching the edge then it’s a ‘small’ but if they’re slightly detached from the edge then it’s likely to be a ‘pearl’. To be honest this didn’t help me very much, particularly as they never stopped still for more than a few seconds. Plus, I really need to put my reading glasses on to see things close-up but find they don’t help when I’m looking through the camera. After a while whilst looking through the viewfinder I did notice that the veins on the underside of the wings were brown on the ‘pearl’ and almost black on the ‘small’. I later verified this in one of my butterfly guides. I also found that the ‘pearl’ was generally more of a yellowy-orange. However, this could simply be due to the fact that the majority of the specimens that I saw looked older than the more recently emerged ‘smalls’. They may have faded. When I got home and viewed my images on my computer the differences between the two species became more obvious, as was the fact that I’d taken more photos of the Small Pearl-bordered Fritillary, like the one above which I believe is a male. Anyone know what species the ant is?